Looking for an app to help boost your literary knowledge? Then your in luck, as the British Library launches their first smartphone app today. 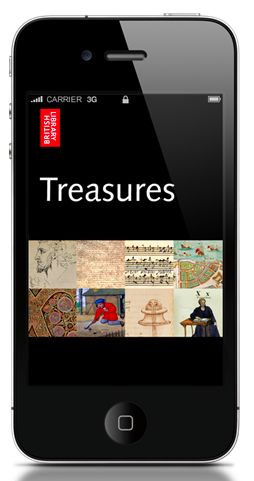 The ‘Treasures’ app, presents a selection of the items featured in the Library’s Sir John Ritblat Treasures Gallery, allowing users to now interact with the Library’s collections when and where they want. The app offers users a full multimedia experience, including over 100 of the Library’s greatest collection items, 250 high-definition images, over 40 videos providing expert commentary, textual interpretation for deeper understanding, as well as up to date information about the Library’s current exhibitions. Some of the highlights include an up close look at the Library’s most unique items, such as the first edition of Alice’s Adventures in Wonderland, the world’s oldest bible Codex Sinaiticus, Nelson’s Battle Plan, written before his victory at Trafalgar, Galileo’s letters and Leonardo Da Vinci’s notebooks. Expert commentary is provided on many of the items and users can watch videos explaining what exactly you are looking at. Treasures is available on both the Apple and Android OS for £2.39. There is also an HD version available for the iPad for £3.49. Should you be worried about Facebook Instant Personalisation?